I didn't have a choice! I Y-you don't understand. I-I-I never used to believe in anything. Well, ex-except science -- quantum mechanical unpredictably. But then the end of the world happened, and everyone around me -- my friends, and my-my Mom -- they all started to die. But God chose me? What What does that even mean?! Michael said he wanted to save the world, not kill it. But he -- he hurt so many people. When I couldn't perfect the spell, Michael, he got mad and threw me in the dungeon. And I was so scared, but I fixed it. B-but I -- I couldn't do it anymore. A (slightly tweaked-out) prophet of the Lord, the Kevin Tran of the Apocalypse World served under the archangel Michael. He rationalized his servitude with the fact that as a prophet he is to serve God, but with no God around he had no choice but to serve the ranking deity, Michael. Kevin is brought to Michael with the news that he has devised a way to open a rift between the worlds, with the aid of the angel tablet. 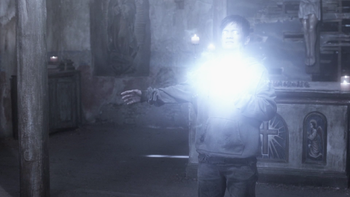 The key ingredient of the spell is archangel grace, and he points out that Michael refuses to donate any of his. Michael proceeds to extract a portion of Lucifer's grace and hands it over to Kevin. As Kevin is preparing the spell at the altar, Lucifer questions what he is doing working with Michael, telling him how Michael is a monster. Kevin replies that he has no choice as he is a prophet who needs to serve the ranking deity, who is Michael now that God is gone. He then points out that Lucifer is "Satan" and the real monster, and explains that Michael plans on taking him to "paradise world" to meet women. As Michael arrives, Kevin begins performing the spell, reciting an Enochian incantation before pouring Lucifer's grace into the bowl. The spell turns out to be a success, opening a rift in the church. During the commotion Lucifer is able to escape through it, and it seals itself behind him. Kevin's enthusiasm that the spell worked is quickly cut short when an angry Michael orders him to "fix" it. Kevin activates the sigil carved on his chest. Kevin is found by resistance fighters in the dungeon of Michael's Fortress. He is called out as a traitor for turning his back on his own kind and serving the angels. Kevin begins pleading, telling Jack, Mary, and the other fighters he didn't have a choice. He describes how, once the Apocalypse started happening and his friends and mother began dying, Michael promised him he was going to help people. He then reveals that after he failed to perfect the spell for another rift, Michael threw him in the dungeon before abandoning his fortress. Noticing him becoming agitated, Mary attempts to comfort Kevin, asking him what Michael has planned. Kevin is forthcoming, revealing that there is a place to the south where the walls between the worlds are thin, and that Michael plans on using a modified spell from the angel tablet to open a rift and invade the other world. As Mary and Jack argue about how to go about using the new information, Kevin tells an eager Jack that Michael doesn't do anything without a reason. 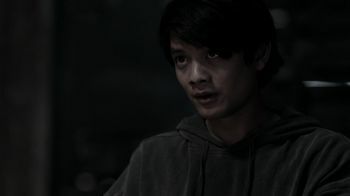 As Jack and Mary continue arguing about Jack's plan to attack Michael, Kevin reveals himself as a plant, unveiling a sigil carved into his chest. He tells Mary he is sorry but he can't take it anymore, and wants to see his mother in Heaven. Mary attempts to dissuade Kevin by telling him Heaven is nothing but memories, but Kevin doesn't care. When Jack tells him his spell won't kill him, Kevin tells him it isn't meant to. Michael wants to break him by killing those around him. Kevin apologizes one last time before activating the sigil and exploding in a violent white light, killing himself and everyone in the room except for Jack, and Mary, whom was shielded by Jack's wings. This page was last edited on 21 December 2018, at 00:11.